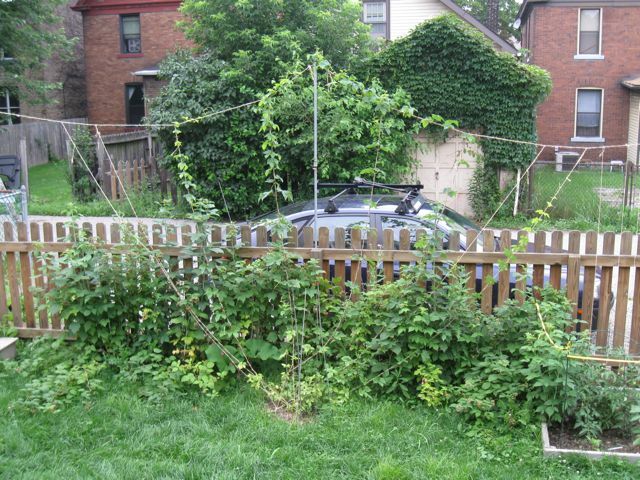 My hops are still going strong. and are starting to send out their horizontal runners. The two lines on the far left were a lawn mower casualty, but they weren’t growing very strong anyway. The strongest center bine, which broke off near the top, did start growing side runners soon after it was lopped off, and those continued up the line where the main bine stopped. The overall size of the plant is bigger than last year, but it still feels like it’s a bit crowded on this short trellis. 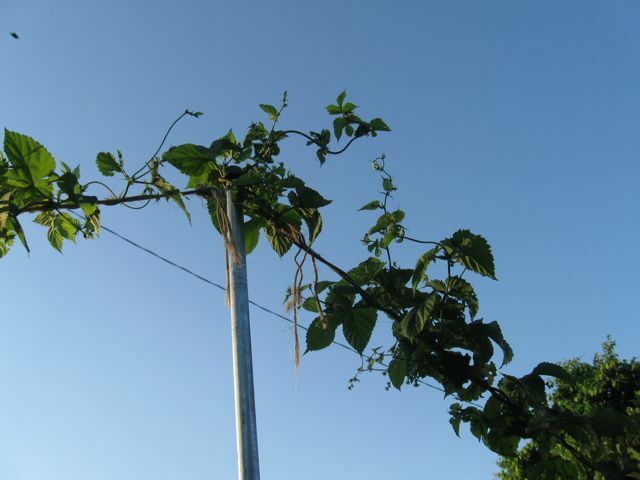 The hop cones themselves tend to grow on the side runners and not on the main bines. In this newer picture of the topmost section of the plant, you might be able to see several small hops “burrs,” which are the immature hop cones. Regarding the twine used for training the hops up the trellis: I’m happy with the way it worked this year. The vertical strings make almost no difference once the hop plant gets to the top, because the hop bines themselves are much thicker and stronger than the twine. I used 3 pieces of twine across the top, with knots at 1′ intervals to keep them from untwisting. This has proven strong enough through our recent very large storms and winds (tornado on the South Side??) The gaspipe vertical poles have also worked fine. We’ll see how much yield I get this year, but I’m considering a taller vertical pole for next year, because the “wide instead of high” theory doesn’t seem to be working as well as I had hoped.